Please ensure that your child is on the green at least 15 mins before the throw in time of their match so the team mentors can get them organised. Brady's Butchers and Horkan's Supervalu are providing all items free of charge to us, so all proceeds raised will go to St Jude's GAA club. 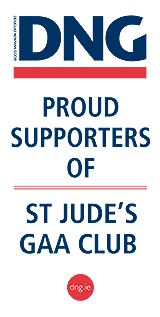 Please ensure all players wear their full St Judes gear & their gum shields for the duration of the tournament.